A dog presented to DoveLewis in respiratory distress, an uncommon presentation for her diagnosis. Read this article to learn more about salivary mucoceles from Coby Richter, DVM, DACVS. An eight year old spayed female Australian Shepherd–mix pre­sented to DoveLewis for 12 hours of acute onset of progressive dyspnea. The owner first noticed a “mass” on the left side of the dog's neck one week earlier and observed it to be growing visibly on a daily basis. The owner did not observe any evidence of pain or pruritis associated with the swelling. The dog continued to eat and drink normally until the day of presentation and there was no history of sneezing, coughing, vomiting or difficulty swallowing. The owner was not aware of any prior health problems other than a vaccine reaction. There was no his­tory of trauma or recent travel. Upon presentation, the patient was bright, alert and responsive. She was panting with an obvious inspiratory stridor and cyanotic mucous membranes. A large, soft, fluctuant swelling was palpated caudal and ventral to the ramus of the left hemimandible. The remainder of the physical exam was unre­markable. After placement in an oxygen cage, her mucous membranes became pink with a capillary refill time of less than 2 seconds. She weighed 36.3 pounds. Radiographs of the cervical soft tissues and skull and two views (ventral–dorsal and right lateral) of the thorax were taken. The thoracic films were interpreted as within nor­mal limits. However, the radiologist noted a soft tissue mass effect cranial to the laryn­geal region resulting in “caudal and dorsal displacement of the hyoid apparatus.” This radiographic appearance made a laryngeal mass unlikely. There was no evidence of a radiopaque foreign body. An in–house complete blood count and chem­istry panel showed a high–normal total white cell count (15.5 thousand cells/microliter), a mild neutrophilia (12.97 thousand cells/micro­liter), packed cell volume of 55% and total solids of 6.0 g/dl, mild hypernatremia (165 mmol/L), hyperchloremia (127 mmol/L) and hyperglycemia (204 mg/dl). The remainder of the results was within normal limits. After peripheral IV catheter placement, the dog was sedated with 1.6 mg hydromorphone and 3.3 mg midazolam intravenously to allow for needle aspiration of the fluctu­ant swelling. Approximately 40 ml of blood tinged mucoid fluid was removed via an 18 g needle, extension set, three–way–stopcock and syringe before she became increasingly dyspnic and was returned to the oxygen cage. The fluid was submitted for culture and cytology to a reference laboratory. The fluid had a protein of 3.2 g/dl, red blood cells of 136,000 cells/microliter, nucleated cells of 6,090 cells/microliter which were 87% large mononuclear cells. The cytological description included “many vacuolated mac­rophages, moderate numbers of hematoidin crystals both free and within macrophage phagosomes, few lymphocytes and nonde­generate neutrophils and few to many red blood cells.” No infectious agents were seen. Chronic inflammation typical for a salivary mucocele was the diagnosis given. The patient's dyspnea improved in the oxygen cage following partial decompression of the sus­pected mucocele over the following 6 hours. She was described as eupnic 12 hours after arrival. She was weaned off of supplemental oxygen and offered food and water through­out the following 12 hours. Thirty–six hours following presentation, the dog was anesthetized to allow complete pharyn­geal and laryngeal examination followed by surgery. She received a dose of periopera­tive antibiotics (cefazolin at 22 mg/kg IV). A fluctuant swelling was visible caudal to the left vertical ramus obscuring the rima glottidis. The buccal mucosa overlying the swelling was pink and showed no signs of trauma or inflammation. The remainder of the examination was unremarkable and the dog was intubated with the aid of a second laryngoscope blade oriented 90 degrees to the first to displace the mucocele laterally and allow visualization of the larynx. Surgical removal of both the left sublingual and mandibular salivary glands was performed via a lateral approach taking care to excise all of the glandular tissue. 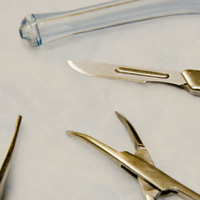 Following closure of the lateral surgical site, an oral approach to the pharyn­geal mucocele was made and the gelatinous material suc­tioned from the cavity. After resection of redundant pharyngeal tissue, the edges of the granulation tissue were sutured to the buccal mucosa to marsupial­ize the cavity into the mouth. The mucocele was lavaged with warm saline and drained as completely as possible. The glandular tissues were submitted for histopathology. Post–operative recovery was uneventful. The dog was continued on cefazolin for 24 hours perioperatively after which antibiotics were discontinued. Pain management included hydromorphone initially, and then transitioned to meloxicam and tramadol hydrochloride for go–home medications. The dog was sent home the day following surgery with no evidence of dyspnea, ptyalism or pain around the surgical site. She has remained free of any swelling or other complications from the salivary mucocele. Histopathology on the submitted glandular tissue did not reveal any neoplastic cells and the culture of the initial aspirated fluid yielded no bacterial growth. Salivary mucoceles, also known as sialo­celes, salivary cysts and honey cysts, are thought to result from trauma to a salivary gland or duct resulting in leakage of saliva into the tissues. Mucoceles differ from a true “cyst” in that they are lined by inflam­matory connective tissue rather than an epithelial lining. The actual cause is rarely identified; however choke collars, foreign bodies and sialoliths have been proposed in the literature. In this case, the owner suggested that the other dog in the house­hold often grabbed Ali by the neck when wrestling and may have been the inciting trauma. The sublingual salivary gland is the most commonly affected gland ¹, but the mandibular, zygomatic, parotid and the molar (cat) glands have each been reported. Differential diagnoses in this patient's case included salivary mucocele, abscess, hematoma, esophageal/pharyngeal for­eign body, sialolith, sialadenitis, salivary neoplasia, and lymph node pathology. Cytology in combination with radio­graphs helped eliminate several differ­entials in Ali’s case. Sialography could have been performed to further identify involved gland(s) in this case; however with inflammation and compromise of the duct system, this can be a challenging procedure. Because the duct systems of the mandibular and sublingual glands are intimately allied, both glands are always removed at surgery. 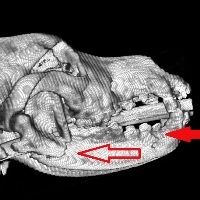 In this dog's case, the location of the external swelling and the pharyngeal swelling seen at intubation were both highly supportive of involve­ment of the sublingual gland, so the deci­sion was made to proceed with removal of both sublingual and mandibular glands. Acute dyspnea is a rare presentation for a dog with salivary mucocele ¹ ². The gland involved determines the clinical signs, with many patients asymptomatic. A cervical mucocele, involving the mandibular and/or sublingual glands, results in a fluctuant, non–painful swelling in the cranial ventral cervical area. Leakage of the sublingual gland or duct into the tissues lateral to the tongue is termed an oral mucocele, or ranula, and can result in ptyalism, dysphagia, and anorexia. Occasionally, the ranula can grow in size large enough to cause protrusion of the tongue. A pharyngeal mucocele is due to leakage from the mandibular and/or sublin­gual glands, like the cervical mucocele, how­ever the primary swelling protrudes into the pharynx and can result in inspiratory stertor to dyspnea depending upon the degree of upper airway obstruction. Dysphagia and retching can also be clinical signs of the pharyngeal mucocele. The zygomatic muco­cele involves only the zygomatic gland and can result in exophthalmus, strabismus, and/or periorbital swelling. 1. Bellenger CR, Simpson DJ: Canine sialoceles: 60 clinical cases, J Small Anim Pract 33:376, 1992. 2. Spangler WL, Culbertson MR: Salivary gland disease in dogs and cats: 245 cases (1985–1988), J Am Vet Med Assoc 198:465, 1991. 3. Waldron DR, Smith MM: Salivary mucoceles. Probl Vet Med 3:270, 1991.